Jimbaran - Institute for Research and Community Service (LPPM) Udayana University holds General Briefing KKN PPM Force XVII Year 2018, Tuesday (26/06/2018) at Auditorium Building Widya Sabha Bukit Jimbaran Campus. Demonstration of KKN this time followed by 3431 students which will be deployed in 170 villages in Bali. 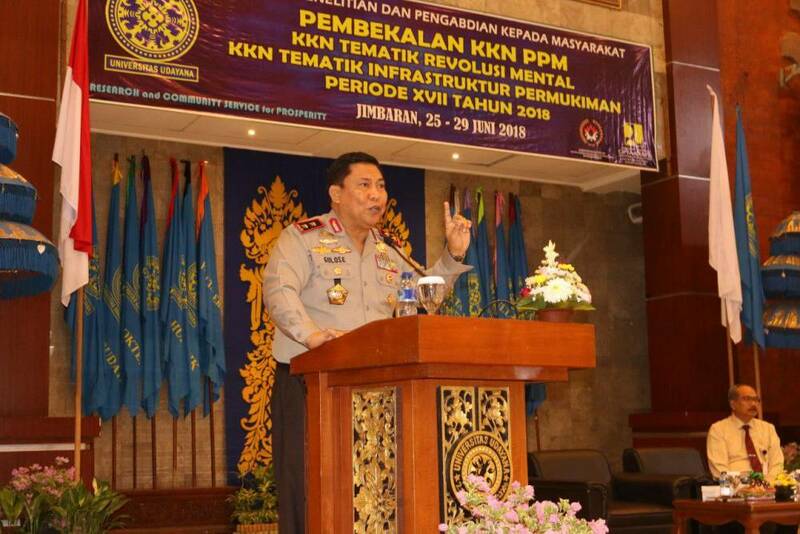 The event was opened by the Rector of Unud by presenting two speakers namely the Bali Police Chief which provides briefing on the theme of "Radicalism and Terrorism in Facing the Global Threat" and the Head of BNN Bali Province with the theme "Anti Drugs". Chairman of LPPM Unud, Prof. Dr. Ir. I Gede Rai Maya Temaja, MP in his report conveyed KKN has aim to increase empathy and awareness of student to environment, inculcate personality value, increase national competitiveness and encourage learning community and learning society. In general, this training is expected to provide supplies and understanding for students participating KKN about the character of nationalism, radicalism and drugs so as to prevent them and the empowerment of village communities and the prevention of corruption. Rector of Unud, Prof. Dr. dr. AA Raka Sudewi, Sp.S (K) in his speech convey KKN is one of the mandatory program in every academic year for students and is a mandatory intrakulikuler activity for Unud students who in the implementation of its activities combine Tri Dharma Perguruan Tinggi, that is Education, Research and Dedication Society. KKN program is essentially a program of learning and community service in the community. In order for KKN Unud to be successful and able to empower the villagers, all KKN participants should be provided with debriefing related to KKN programs in the villages such as nationalism, radicalism, drug abuse, HIV and environmental health issues, social ethics, community empowerment, and potential village. KKN-PPM activities at Unud is a vehicle for students who not only to improve intellectual intelligence, but also emotional and spiritual intelligence. Thus, students are expected to be able to understand and provide solutions to real problems in the midst of the communities in which they are deployed.